Mis en place for doughnuts! So there is a terrible downside to watching cooking and food based shows while cooking. 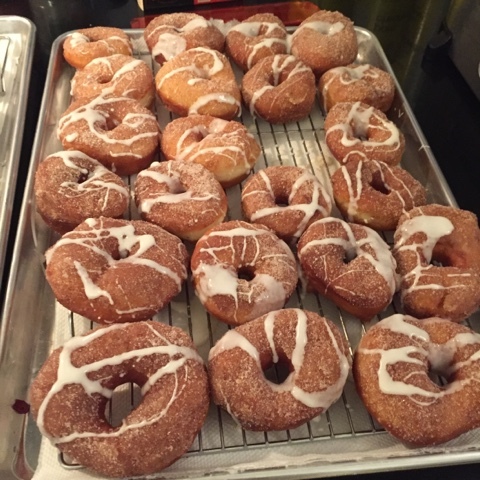 Don't believe me - then ask how I ended up getting inspired to make doughnuts. Now again they are amazing but honestly you should not trust me to sit around and fry dough and not want to try some. In any event I was watching Good Eats and was inspired to try making doughnuts. I make bread, cinnamon buns, pizza dough from scratch why can't I try making doughnuts. So I did a search on Foodnetwork.com and found Alton Brown's recipe for yeast based droughts and had to give it a try. The first inaugural fried item! Now oddly enough I have been watching the show "Worst Cooks in America" I don't personally think I need that show - but the tips, tricks and methods that they demonstrate in the show are sometimes really fantastic and helpful in life - not to mention I have had a few of my inspirations for things I want to make come from the show. The one thing I have really taken away from the show is mis en place - now I've heard this term a lot and I'm sure any other person who watches these types of show has heard of the term mis en place - basically meaning to get all of your ingredients and things prepared before hand. I of course learned this skill/technique in high school and them promptly stopped following it a while ago. This combined with not always reading a recipe all the way through before starting has occasionally lead to a few interesting times in the kitchen. However, I figure it really ought to be a practice I start getting into - although when considering time restrictions I'm not sure about always doing it - but in any event I mis en place'd and I'm proud of it! Place the milk in a medium saucepan and heat over medium heat just until warm enough to melt the shortening. Place the shortening in a bowl and pour warmed milk over. Set aside. in a small bowl, sprinkle the yeast over the warm water and let dissolve for 5 minutes. After 5 minutes, pour the yeast mixture into a large bowl of a stand mixer and add the milk and shortening mixture, first making sure the milk and shortening mixture has cooled to lukewarm. Add the eggs, sugar, salt, nutmeg and half of the flour. (The original is like this - I usually add my sugar to the warm water with the yeast to help them get going). 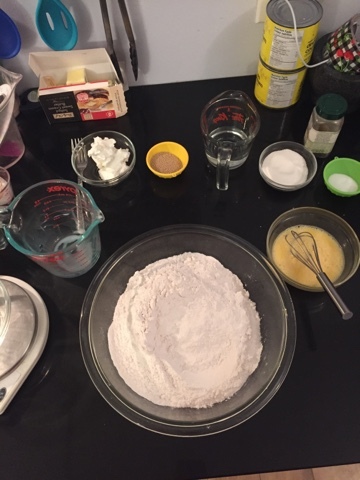 Using the paddle attachment, combine the ingredients on low speed until flour is incorporated and then turn the speed up to medium and beat until well combined. Change to the dough hook attachment of the mixer and beat on medium speed until the dough pulls away from the bowl and becomes smooth, approximately 3 to 4 minutes. (I found the dough to be sticky and not like bread dough in terms of the finish product - I also scrapped down the sides of the bowl when I switched to the dough hook). Transfer to a well-oiled bowl, cover and let rise for 1 hour or until doubled in size. (Based on a previous mishap with bread - I made sure to turn the oil in the bowl so it was coated all the way up the sides of the bowl. I also placed my bowl in the oven the same way I do for bread. I turn on the oven for about 30 seconds, and then place a cake pan full of really hot tap water on the bottom of the oven and then place the bowl in half way up - I find this helps make my bread and yeast doughs very happy). On a well-floured surface, roll out dough to a 3/8 inch thick. Cut out dough using a 2 1/2 inch doughnut cutter or pastry ring and using a 7/8 inch ring for the centre whole. Set on floured baking sheet, cover lightly with a tea towel, and let rise for 30 minutes (again back into the oven) (I found that the dough was a little weird to get rolled out at first but I quickly got the hang of it. I wold also note that I probably should have picked up and turned the dough before cutting out the circles only because the circles I cut without doing this shrunk back up). 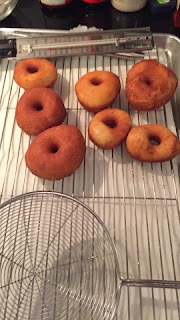 Preheat the oil in a deep frying or dutch oven to 365 degrees F. Gently place the doughnuts into the oil, 3 to 4 at a time. Cook for 1 minute per side. Transfer to a cooling rack placed in a baking pan (note: I lined the bottom with paper towel - smart idea!!) Allow to cool for 15 to 20 minutes prior to glazing. Now I both glazed and sugar coated my doughnuts - I will post how I coated them in sugar - but next time I would just dump my doughnuts into the sugar right out of the deep fryer. To sugar coat them - I melted a stick of butter in a small pan, and then mixed 1/2 cup sugar and 1/2 tsp ground cinnamon in a bow( I also added a dash of fresh ground nutmeg). 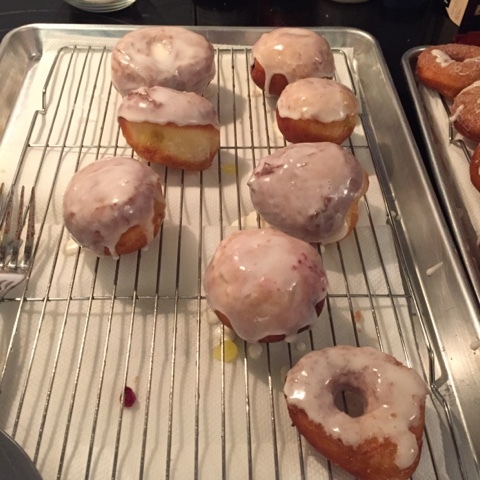 I then dipped the doughnuts into the butter and then sugar (just on one side). However, next time I would probably go right from the fryer into the sugar. I took the last remaining parts after the dough couldn't be rolled out again in a good fashion and made little balls thinking I could make doughnut holes. They actually turned out larger than expected so I ended up filling them with lemon custard or bumble berry jam and glazed them. To make the glaze I heated 1cup milk on the stove to almost a simmer, then added vanilla and 2 cups powdered sugar. 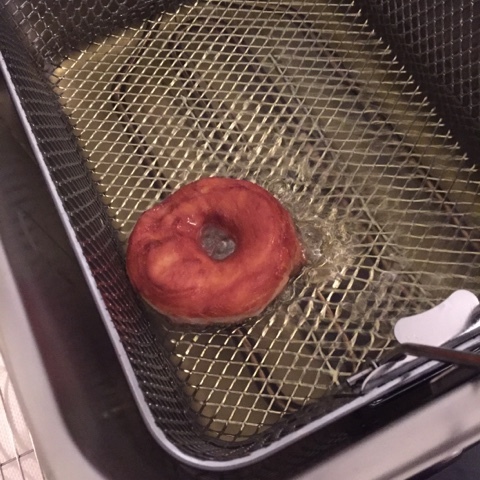 I then turned off the burner and dipped the doughnuts. Because I had extra glaze left over I ended up using a fork and sprinkling a little over the cinnamon sugar doughnuts because - well why not add a little more sugar right? !